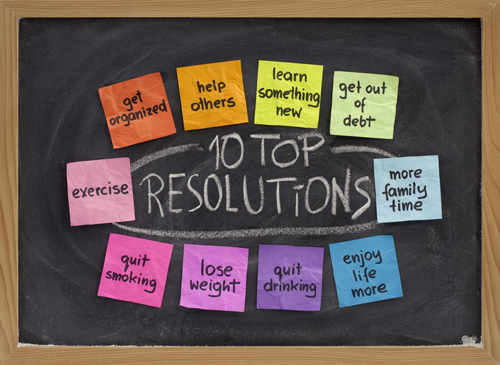 Every year people are good at making resolutions, but they soon fail before the first month is complete. UAB Internist, Jane Jung, MD, says you can improve your chances of success by following these four steps: identify an attainable goal, specify a plan to reach it, give reasons why you want to fulfill the resolution, and enlist the help of accountability partners. 1. Set an Attainable Goal Jung and her colleagues recognize every patient is different and needs an objective that works for the individual. They discuss with patients the implications for their health if no changes are made, and ambitions they can pursue to improve their overall health. Joshua Klapow, Ph.D., associate professor of public health, clinical psychologist explains that many people set inspirations instead of resolutions, which require action. “Those that tend to set more specific, objective, reachable goals on average can reach them more than those who lost the unquantifiable resolution,” states Klapow. Jung encourages her patients to set a goal that is reachable and specific so they know what kind of changes they have to make to obtain it. She gives the example that patients will want to start a new kind of exercise but have not considered the duration or frequency required. “Without those specifics, it’s hard for patients to keep themselves accountable and for others to help keep them accountable,” Jung stresses. 2. Make a Plan to Reach it For exercise purposes, Jung challenges patients to identify a type of exercise they are interested in picking up and specify where, how often, and long they plan to do it. The same is applicable for patients deciding to cease smoking. Set a stop date and a plan on how to get there. “Patients should also think about situations that might make picking up a cigarette tempting and avoid those people and places,” Jung says. If such situations are unavoidable, then patients should decide ahead of time what they can do to avoid smoking when in these situations. 3. Decipher Reason for Goal According to Jung, patients set goals like losing weight or quitting a bad habit without establishing how and why they are pursuing it. “Having the why clearly determined beforehand can give patients something to look back upon to help motivate them when the resolution begins to feel like just another menial task,” Jung says. Klapow agrees; success is more likely when you are passionate about the purpose. “Regardless of the resolution, if you can translate it into an action or behavior you are much more likely to be successful,” he confirms. 4. Accountability is Crucial When it comes to new resolutions, Jung explains having external motivation when internal motivation is lacking is crucial to holding patients to their goal. She refers patients with the goal of losing weight to UAB’s EatRight Program (now offered as part of the new UAB Weight Loss Medicine clinic at UAB Highlands) because it offers excellent tools and accountability models. Laura Rogers, MD, MPH, Professor in the Department of Nutrition Sciences, board certified internist, and one of the EatRight Program weight loss medicine physicians, helps patients get their weight loss on track. Participants interact with a physician, dietician and exercise trainer to design an individualized plan of attack and establish accountability. The EatRight team encourages success and accountability with patients through weekly weigh ins and having them turn in their diet logs. 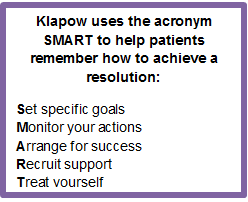 Getting SMART Klapow uses the acronym SMART to help patients remember the actions necessary to achieve a resolution. They must set specific goals, monitor their actions, arrange for success, recruit support, and treat themselves. He professes that these five steps apply to any change of behavior. For those that may fall off the wagon, Klapow suggests that if you miss three days you must reassess your goals, write down the reason for not sticking with it, and then pick a date to start back. “Being successful at resolutions means being successful at changing your behavior independent of what the resolution is,” he says. For more information on weight loss medicine click here.